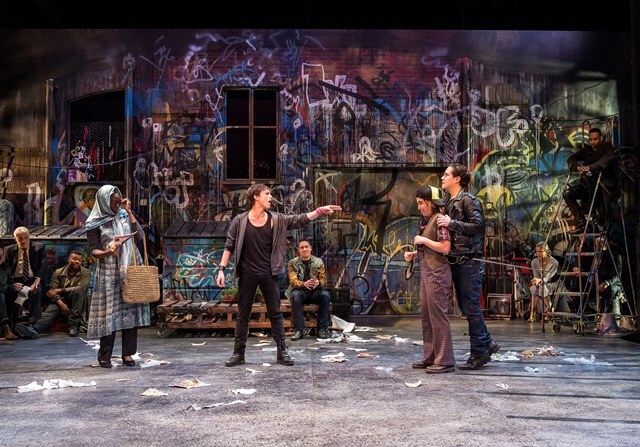 In director Dámaso Rodríguez’s version of Romeo and Juliet, a group of actors gathers to put on the play in a graffiti-covered alley. A pair of dumpsters, two wooden pallets, and a movable iron ladder makes up the bulk of the set pieces. Everything is covered in spray paint and decay. The contemporary urban setting adds significant weight to the themes of Shakespeare’s story and is remarkably shrewd in its point of view. Graffiti as an art form has long been the expression of those whose opinions run contrary to society, much like we see in the characters of Romeo and Juliet. Born into two families who have hated each other for longer than anyone can remember, they defy their parents and fall in love. Right or wrong, they will do anything to be together. It is a stance that every teenager understands – the moment when you begin to pull away from authority and make your own choices regardless of the consequences – that speaks to the popularity of the play, generation after generation. On this canvas, love and hate struggle for the upper hand. And while we know how the story ends, it doesn’t mean we still don’t hope that this time, somehow, the tragedy will be averted. It is powerful – this ongoing conversation about love and hate, especially in 2016. 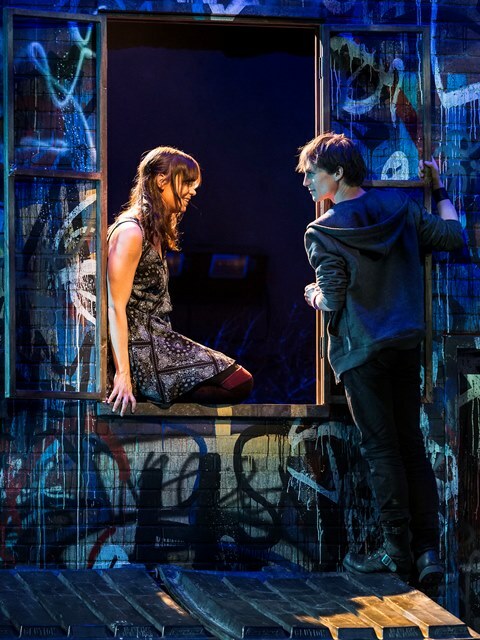 Will Bradley’s (Romeo) hollow-eyed intensity and Donnla Hughes’ (Juliet) poise and stillness make them seem older than their scripted years (Juliet is written as 13, Romeo a few years older) yet it feels appropriate for this setting. Their choices lend a modern authenticity to Rodríguez’s telling of the story in a day and age when young people are forced to mature earlier and earlier. Where it muddies the waters, however, is in the approach to the text. The play offers up some of Shakespeare’s most beautiful and compelling poetry however, in this production, much of the verse is actually interpreted as prose, often with frequent pauses inserted for dramatic effect. While the choice may fit the time period, it doesn’t always do justice to the form and that makes it easier for an audience to become distracted. Some of the liveliest exchanges take place between Romeo and Mercutio (Rafael Goldstein) whose raunchy innuendo and lack of boundaries provides great opportunity for humor. From his Queen Mab speech taking place on a rolling ladder to his conjuring of Romeo out of the shadows, Goldstein always takes the unusual path. A barefooted bumbling Friar Laurence (Robertson Dean) and nurse-with-attitude (June Carryl) show how Shakespeare’s adults are often powerless in the greater scheme of things. Alan Blumenfeld’s (Capulet) astute powers of observation add an intriguing layer to the dynamic of the Capulet party. With everything taking place on a single set, scenes and locations are announced by cast members who watch from the edges of the stage when they are not involved in the action. Simple but striking touches capture the essence of each scene. Whimsical lighted party dresses emerge and float on chains for the Capulets’ party. A mattress is thrown on top of the dumpster as the grave of the dying lovers, and a macabre laundry line of doll babies is strung across the back wall after the danger escalates (perhaps to suggest the death of innocence). And always there is Martin Carrillo’s subtle but expressive soundscape lingering in the background, erupting each time the violence on stage bubbles up, using found objects and the dumpsters as drums. 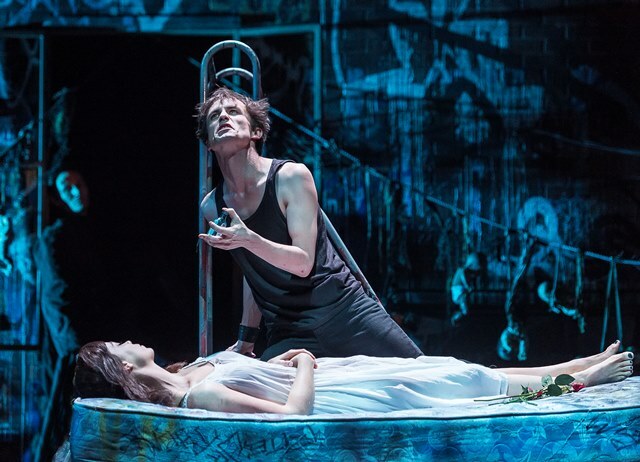 With a seductive undercurrent and small unexpected moments of beauty in a distressed street setting, A Noise Within’s Romeo and Juliet reminds us that hate is never the answer. Like the idealism of every new generation, it demands that we get our house in order and move toward love. That is a story that never gets old. Single Tickets from $44. Student Rush with ID an hour before performance $20. Groups (10 or more): Adults from $30/ticket; Students from $18/ticket.